Changes in working practices, such as the introduction of new technology or the alteration of targets, may cause stress, or stress may be built into an organization’s structure. Organizational stress can be measured by absenteeism and quality of work. Stress affects organizations as well as the individuals within them. An organization with a high level of absenteeism, rapid staff turnover, deteriorating industrial and customer relations, a worsening safety record, or poor quality control is suffering from organizational stress. The causes may range from unclear or overlapping job descriptions, to lack of communication, to poor working conditions, including “sick building syndrome”. This is when a lack of ventilation, insufficient lighting, and inadequate insulation in a building contribute to consistently high levels of illness and absenteeism. 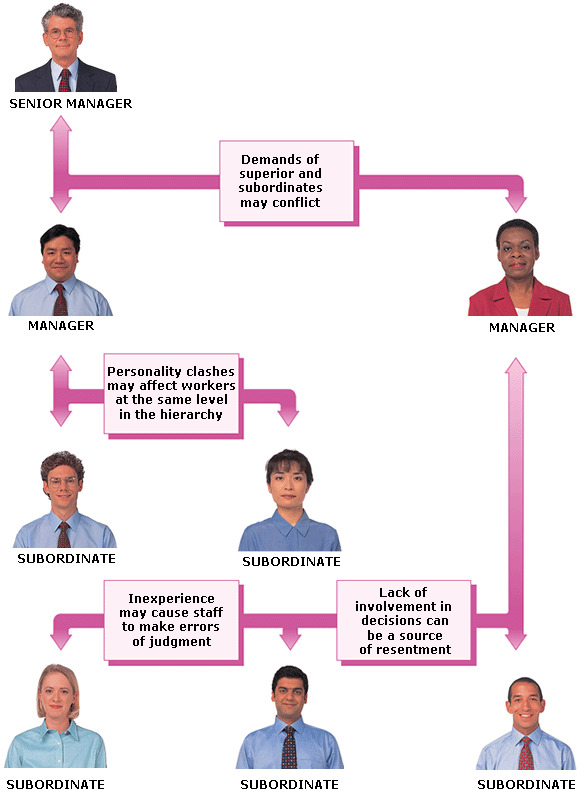 The chart here shows one example of the structure of a department in an organization, indicating typical causes of stress that may affect staff at certain levels in the structure, and particular causes that are affecting individuals. Stress is contagious: anyone who is not performing well due to stress increases the amount of pressure on their colleagues, superiors, and subordinates. Low quality of service. An increase in complaints received and customers lost costs time and money. Complaints take time to deal with, and replacement products or services cost money. Loss of customers endangers a company. High staff turnover. Both time (for retraining) and money (for recruitment) are spent on replacing unhappy workers. Poor reputation. A company with dissatisfied customers is going to have to pay for changes to restore confidence in its products and services. Poor organizational image. A company may recruit only a low-quality – or inexperienced – workforce, since high-fliers are unlikely to be attracted to it. Dissatisfied workers. Valuable time is spent in disputes with management over terms and conditions of employment. Next time you feel you have too much to do, delegate at least one task. Learn from those who do not suffer from stress. Avoid routinely working late and at weekends. - Understanding Stress : What is Stress?